This fabulous 1951 Studebaker Champion Street Rod is owned by Bill Junge of Lake Havasu City, Arizona. If you look close, you can see that it started life as a 4-door sedan. Bill's is powered by a Chevy 350 V8 mated to a Turbo Hydramatic transmission. The car has been lowered, the rear wheel well opening have been raised, and the front bumper has been moved closer to the body of the car. Other modifications include frenched headlights and taillights, shaved door handles, and a third light over the rear window. 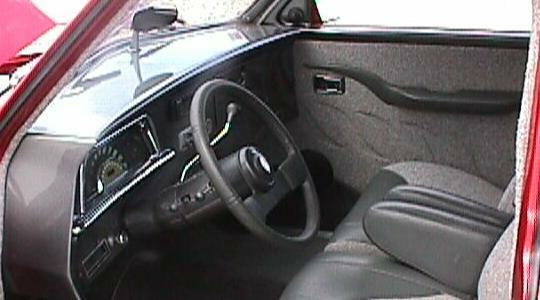 The car also has air conditioning, tilt steering column, and a sound system with CD player and power antenna. Bill actually drove this car to work on a daily basis while it was being built as a rod. 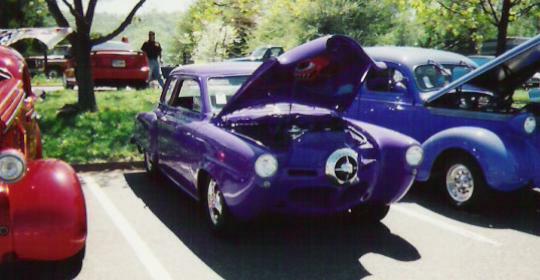 These pictures of a cool 1950 Studebaker Champion Street Rod were taken at the Spring Charlottesville Cruisers Car Show at Piedmont Virginia Community College. The 1950 model had a large chrome bullet with a single wide ring while the 1951 model had somewhat smaller plastic bullet and two narrower rings. Otherwise, the 1950 and 1951 models appear quite similiar. This rod is a 2-door sedan that has been dechromed but otherwise has a mostly stock body. 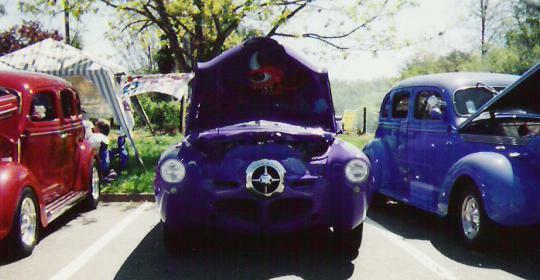 The purple paint, however, is anything but stock.